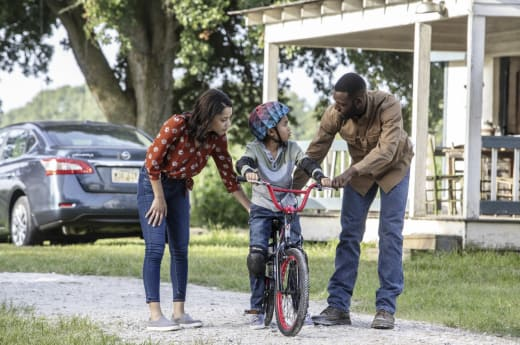 A beautiful day is coming, or at least that's what I choose to believe after Queen Sugar Season 3 Episode 12. Because I refuse to accept that all hope is lost or that the Bordelons will walk away from this fight. What I couldn't believe was how quickly Prosper ratted out Charley to the rest of the community, especially since she took him in when he needed it the most. I could understand him being upset, but to spread that news around after Charley invited him into her home, took care of him and sat with him at the hospital when his own family couldn't be bothered to show up seemed particularly ungrateful. I love Prosper but this made me think less of him. Who knew that Prosper was such a gossip? Did he run right out and tell everyone he could the moment their conversation ended? 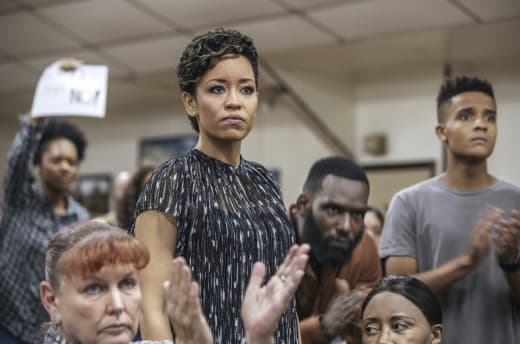 Everyone was quick to blame Charley, yet no one seemed to remember that it was the members of her own community who readily believed Sam's lies and bailed on her and the Queen Sugar Mill. She could have lost everything, or just walked away, instead, Charley made a deal that would give the farmers fair and stable rates for five years. As she attempted to point out, her deal allowed them to fight another day, but not if the Landrys use that farmland to build a prison. I appreciated that there were two sides to this story. For some, the jobs that a correctional facility would bring must seem like hope in an unstable economy. But that hope would come as a great loss for many others, and although the work might be steady, minimum wage doesn't allow for much more than financially hanging on by your fingertips. I'd guess that it's much like Charley says. The company uses their best talking points to sell each town on letting them build their facility and they leave out the downside; that they're locking people up to make a profit. As Remy pointed out, they were offering to build a community they were going to decimate first, then pretend to be the heroes who saved it. Speaking of heroes, I hope that Micah saw his mother through new eyes. 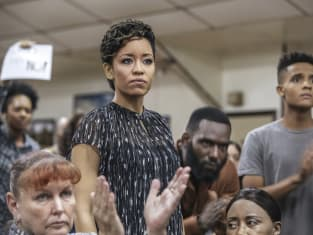 Charley doesn't always play by the rules but she sticks her neck out to help her community and stands up even when no one may be willing to stand with her. The flip side of that is that Charley calculates every move and has the money and the power to whether a storm when it comes her way, Micah's friends aren't so lucky. Doing six months in jail could ruin Ant's future but I appreciate his loyalty to his friends. He's the sacrificial lamb so that they don't all go down for that fire. I can only hope that Micah meant what he said about helping Ant. Thanks to being Charley and Davis' son, Micah will undoubtedly have opportunities and privileges that Ant will not. That also means that Micah will have the power to offer Ant a hand up when he needs it. While we're on the subject of lending a hand, it was wonderful to see Ralph Angel and Darla working together as parents once again. Darla's parents have an enormous amount of influence over her. Her father convinced her to tell Ralph Angel he might not be Blue's biological child, and Darlene was obviously the driving force behind the custody suit. It's so much more satisfying to see Darla stand on her own. She's smart and strong and a good mother, and whether she and Ralph Angel get back together or not, there will always be a certain amount of love there. Elsewhere, Aunt Vi's story was filled with extreme highs and extreme lows. As her business takes off, I continue to wonder how she and Rhonda can produce enough pies. If Vi' Prize Pies continues to grow she's going to need more space and more help. Unfortunately, on this day it was all too much and she finally had to come clean with the rest of the family about having Lupus. It was long overdue, but I think Ralph Angel and Charley handled the news well. The one upside was Romero coming out to help. I can't remember the last time anyone made Charley smile like that, and who can turn down a man who makes exquisite chicken mole? You okay with Nova being with the same man after he’s done with you? And you, I never took you to be one who would be interested in your sister’s sloppy seconds. Aunt Vi didn't hold back, and I wouldn't expect she would, but given that Nova had already called off this relationship, her critique seemed particularly harsh. The one thing that was missing was getting to hear the conversation between Nova and Charley after Violet left. After all of that, you'd think they would have said something to one another. Does anyone else not completely trust Frances Boudreaux? 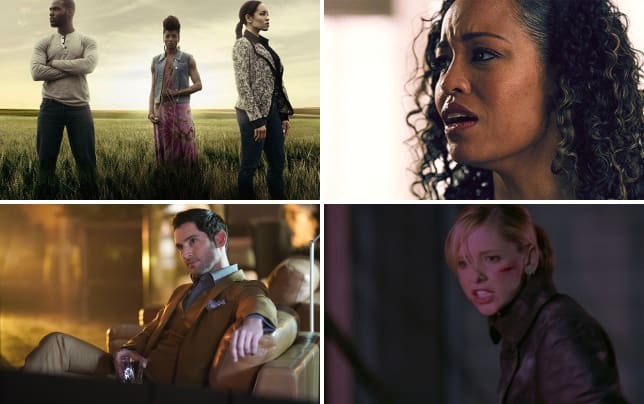 I know she gave Charley the information she needed to take Colton's shares of Landry Enterprises from him, but I'm still not convinced that Frances won't stab Charley in the back if it suits her purposes. Charley: Of course he does. How do we find justice these days when it seems like it no longer exists? Permalink: Of course he does. How do we find justice these days when it seems like it no longer exists? Couldn't Frances help Charley prove which members are in Sam's pocket? Could pulling the town council's corruption and dirty laundry out into the open mean they have to call for a new vote? I can't imagine the Bordelons simply rolling over and allowing this prison to be built in their backyards without a fight, but this council vote a serious blow to their efforts. My father always led us armored with hope even in his darkest days. Now I’m starting to think it was all just fairy tales made up to protect us from the evils just outside our door. The evils do seem to be everywhere these days, but I have to believe there's still hope. Because sometimes you just have to believe. So tell me TV Fanatics, is Frances Boudreaux playing Charley or will she really be an asset in taking down Sam? Will Micah be able to walk away from that fire incident unscathed? And can Charley find a way to stop this correctional facility from being built in St. Josephine? 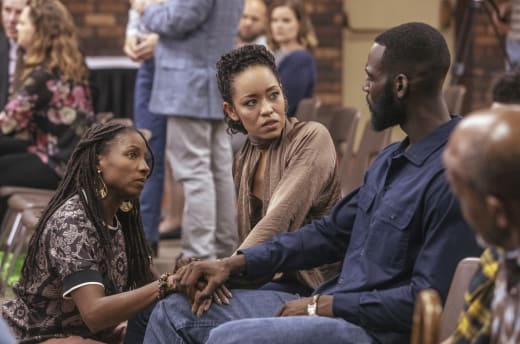 Check back for my review of Queen Sugar Season 3 Episode 13 and until then, you can watch Queen Sugar online here at TV Fanatic.